We specialize in Wedding Makeup that creates a timeless and elegant look that will enhance your natural beauty so you are sure to look flawless and radiant for your special day. 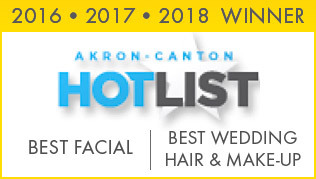 Voted 2016 & 2017 Akron/Canton Hotlist Best Makeup Artist, Christina and her staff have more than 20+ combined years in makeup artistry. Using Jane Iredale All-Natural Cosmetics, a mineral and high definition makeup that looks beautiful on camera and video, Christina and her team will give you the look you have always dreamed of. “Christina did my bridal makeup and far exceeded my expectations. I have always been a very self conscious person, and I was so nervous about the attention that would be on me on my wedding day and how I would look in pictures. Christina listened to my likes, dislikes and concerns, and there is not one thing I would have changed about my makeup. I have never felt more beautiful than I did that day, and have never had more confidence!! I LOVED everyone looking at me! Christina is amazing, and sweet, and I would highly recommend her to anyone. Very knowledgeable and professional. Thank you Christina!” –Ashley S.
We totally get how important your bridal makeup is for your big day and we are so honored to create a look for you to feel beautiful and confident. Brides have traveled from all over to have Love Beautiful Skin perfect their wedding makeup. We are happy to work on-location so you are picture-perfect for your special day or event. If Airbrush Makeup is what you are seeking for your Wedding Day, then Sarah H. is your girl! She is an amazing and talented airbrush artist and will tailor to your needs. And we don’t stop there! We also offer wedding hairstyles and updos that complement your bridal makeup and wedding style. We would love to create a look for you! Please call or reach out to us for with any questions or to see if we have your wedding date available. Please Note: It is Important that our brides’ skin is in the best condition possible, as it will dramatically effect your makeup outcome. At Love Beautiful Skin, we recommend starting a skincare routine and treatment plan 6 months prior to your big day. Foundation, Concealer, Bronzer. Blending Brush, Dome Brush, Eye Contour Brush. Pressed Blush, Cream Blush… so many options and tools, oh my! We understand it can all be a bit confusing, but it doesn’t have to be! We love makeup and we love educating you on how to use the right products and tools to achieve the look you want, all while enhancing your natural beauty and coloring. Schedule a one-hour makeup lesson with one of our talented makeup artists. We carry the full line of Jane Iredale Cosmetics at our North Canton spa location and we’ll focus on your needs and teach you how to use the products. Everything you’ve ever wanted to learn is available with one of our Makeup Artists. Call or email us today to schedule! *A non-refundable security deposit of $150 is due to book and will be paid at the trial makeup session date. This deposit covers the bride’s makeup application. Tax is not included in the service(s) pricing listed and will be added on.